Sansa Stark actress shares conclusion of HBO show with close associates, who so far keep the secret safe. 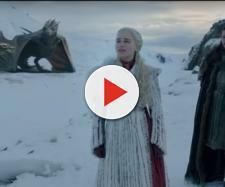 After over a year of "Game of Thrones" fans waiting for what will happen next after the White Walkers breached the Wall on the Season 7 finale in 2017, they had reason to rejoice this month with the first teaser for the HBO series’ eighth and final season. While aficionados of hit award-winning medieval fantasy series scour details of the teaser for clues on how the show might conclude, one of the main actresses has reportedly intimated to her close circle of friends what happens in the end. Actress Sophie Turner, who plays Sansa of the now three-person House of Stark in HBO’s "Game of Thrones," is not too concerned with keeping the storyline classified, as she has apparently shared the ending with friends according to Marie Claire online. She says in an interview, that she is horrible at keeping mum anyway, and when questioned by relatives and buddies about details, she answered them plainly. ‘I’m so bad at keeping secrets,’ said Turner, adding that the "Thrones" production crew no longer appraise her much on plot developments because she might tell someone on the outside. Furthermore, she would also like to make clear that she did not drop the ending spoilers while inebriated. "Nope, sober," Sansa Stark said to W Magazine, according to BGR. Before "Game of Thrones" TV fans start scouring the internet for more info, it needs to be told that while Turner did freely spoil the ending to some, they were not random folks but people who knew the actress personally. In her words, she can trust her confidants to keep everything she told them secret. For those who cannot let this "Game of Thrones" ending spoiler development go, and are curious as to just who Sophie Turner told, it can at least be confirmed that her lucky circle of friends at the time did not include her fiancé Joe Jonas. It was no oversight on Turner’s part, however, as Jonas is a major "Thrones" fan and had already told her not to spoil anything for him when shooting for Season 8 wound down. The second-born Jonas' brother remarked that Sophie is well aware of his fandom, and how bummed he would be if he knew in advance what would happen in the HBO show. The final part of the 8-season ‘Game of Thrones’ saga on HBO will premiere on April 14, 2019. It will run for a total of six episodes, each of which will reportedly run as almost like a feature-length movie.